Rather than making our normal summer cruise in 2009, we instead travelled to China for three weeks. Part of the reason for the trip was to visit the South Coast Marine yard in Xiamen, China, where we had a boat nearing completion. Although it wasn't a cruising trip, we managed to get in a fair bit of boating, ranging from short trips to a multi-day cruise. In fact, we were on a boat in some way or another in every city we visited except for Xian. Although in one case, Xiamen, the boat wasn't actually in the water. The trip started at the South Coast Marine yard in Xiamen. From there we travelled to Hong Kong, Guilin, Yangshuo, Chengdu, Chongquin, Yichang, Xian and Beijing (trip route). We travelled by plane, automobile, river boat, cruise ship, day train and overnight train. We love mountain-top views and travelling by water, and got in a fair bit of both throughout the trip. We sometimes were the only �Westerners� about—James in particular drew a fair bit of attention—but we always received a warm reception. We knew the country was huge and populous, but were amazed at how big the cities were and how fast the pace was. We were told that growth had slowed, but the pace was still impressive. Major apartment complexes were under construction throughout every city, ships were being built and launched, traffic was crazy, and everyone was in a hurry. The scale is astonishing. We expected the smaller towns such as Yangshuo to have only a few hundred residents, but they had several hundred thousand. And the population of the bigger cities is in the millions. The largest, Chongquin, has 32 million residents, more than all of Canada combined (admittedly not a high bar). 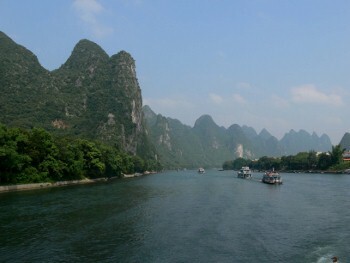 Even Guilin, one of the smaller centers on our itinerary, has over a million residents. 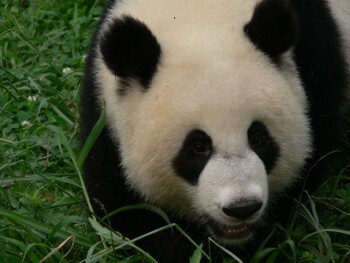 We organized our trip with Interlake China Tours. Instead of a pre-canned group tour, we selected our destinations and itinerary, and they booked the travel, accommodations, and local guides where needed. The prices were competitive with major group tours, but with a flexible itinerary and without the herded cattle feel. The pre-trip support was excellent, the hotels were wonderful, the guides were prompt, friendly and knowledgeable, and the whole transaction was professionally run. We�d definitely book with them again, and recommend the company without reservation.